The gapTCO is an intuitive, graphical user experience designed to allow simple and easy analysis of the Total Cost of Ownership of printer and MFP devices. This month’s edition compares the Lexmark CX825de, HP Color LaserJet Enterprise MFP M681dh, Dell C5765dn MFP and Oki Data MC780+. The Dell C5765dn MFP is the winning product with the lowest TCO of $10,973.48, followed by the Lexmark CX825de with a TCO of $11,539.78, HP Color LaserJet Enterprise MFP M681dh ($11,976.57), and the Oki Data MC780+ ($12,377.75). The Dell C5765dn MFP is the oldest device in the comparison, launching in August 2013, and offers the lowest TCO and Mono CPP. HP’s Color LaserJet Enterprise MFP M681dh is the newest device in the comparison launching in May 2017, followed by the Lexmark CX825de (January 2016), and Oki Data MC780+ (April 2015). The Lexmark CX825de has the greatest number of max trays as well as the largest maximum input capacity in the comparison at 4,500 pages. The HP Color LaserJet Enterprise MFP M681dh is the only device in the comparison to offer mobility print connectivity as a standard feature. 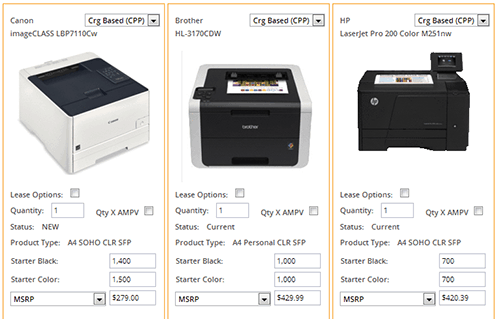 The HP Color LaserJet Enterprise MFP M681dh has the fastest scan speed in the comparison at 83ppm, followed by the Lexmark CX825de (60ppm), Dell C5765dn MFP (45ppm) and Oki Data MC780+ (40ppm). The HP Color LaserJet Enterprise MFP M681dh also boasts duplex scan speeds of 167ppm. All devices compared are Energy Star compliant.